"Working with Simone and Seven Figure CEO helped me take my company to an entirely different level. She got me thinking bigger and communicating my vision to my team and customers in a much more powerful and congruent way which in turn, doubled my revenue." "Simone is a master coach and highly skilled at helping successful people lead better and earn more. Her guidance and thought provoking questions helped me bring about great success in my business, doubling total revenue in the time I worked with her. But that's not the best part. 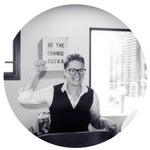 "Simone designed and delivered a one-day workshop for my growing software company. I had several new team members and a big vision and goals for the next year and wanted to create the synergy necessary to reach those goals. Simone created all the right pieces to transform my vision into a vision shared by all my employees. Through her engaging, intuitive and fun delivery my team really gelled. It was a great success." "Simone and I have an ongoing debate: I like to call her my life coach. She insists that she is my executive coach. Aren’t they one in the same? AHA! Therein lies the rub. Simone has helped me realize that my life and my career are not one-in-the-same. This truism we all know, theoretically, but the practice of separation (aka balance) is elusive for the best of us. Simone will not only remind you; she will challenge you. Trust me, she’s not soft. She cuts to the chase. I always learn from her in every session. Along the way, she has made me a better human being." "Working with Simone has encouraged me to reflect on my strengths (cake) and challenges (cringe) in a way that has allowed me to think bigger and bolder about my goals. I have learned tools and tactics from our time together I have applied to both my personal and professional growth plans. Simone asks great questions and provides relevant resources I can turn around and apply to my work right away." ~Rebecca Zanatta, President, RJZ Connections, Inc.
"As a single founder of a growing business my coaching sessions with Simone are like having a business partner to bounce ideas off of and get honest, creative, and positive feedback, which stretches me and my company. Having the set coaching sessions also allows me to set aside quality time to reflect, strategize and plan for the future. To be able to go through this process with somebody with the kind of training Simone has, has been invaluable to my business."